In 1954, Sol Harry Gaylord, Jr. and James Tollinger filed a patent for a “fountain pen pistol.” The U.S. government granted the patent to the inventors’ company in July 1958. The pen pistol features a receiver that resembles a fountain pen, but with a short rifled barrel inside. In addition to the usual clip, the pen includes a cocking piece that releases the striker to fire the gun. The Gaylord pistol pen fires a rim-fire cartridge with a prominent spitzer projectile. The patent doesn’t mention the weapon’s caliber. I was unable to find very much information about Gaylord Products, Incorporated, which holds Gaylord and Tollinger’s patent. 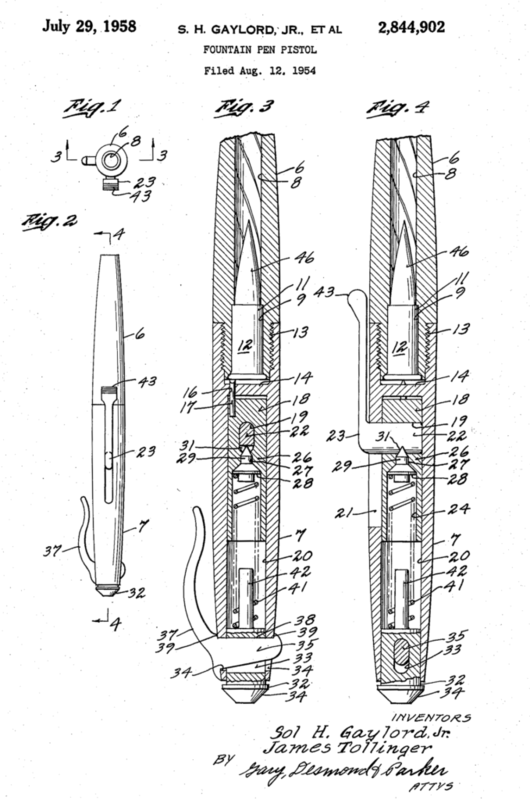 The company patented a number of other products, including hair clips.